Joining an overland odyssey is an excellent way to see and understand Argentina and Brazil, soaking up its scenery as you are transported from one unforgettable sight to another. This 19-day trip kicks off in beautiful Beunos Aires and travels north to the iconic city of Rio de Janeiro. Making frequent stops of a few nights at a time, there is plenty of opportunity to explore the key destinations along the route, and the range of activities on offer ensures each visit is action-packed. After exploring Buenos Aires, the trip heads for the Igauzu Falls, one of South America’s most impressive sights. You will be able to admire these colossal waterfalls from both sides of the border, before moving on to Bonito, the outdoor activity capital of Brazil and a lovely town run on eco-tourism grounds. Here, you have two full days to enjoy all the exciting optional activities, including snorkelling through the crystal-clear rivers and rapelling. The wildlife-packed wetlands of the southern Pantanal are the next stop, which you can explore on horseback, or from boats and canoes, then it’s time to steer towards the coast, to the colonial town of Paraty, known for its tropical islands and excellent diving. Finally, finish your adventure in buzzing Rio de Janeiro, home to the incredible Christ the Redeemer statue and Ipanema beach – a true South American adventure! 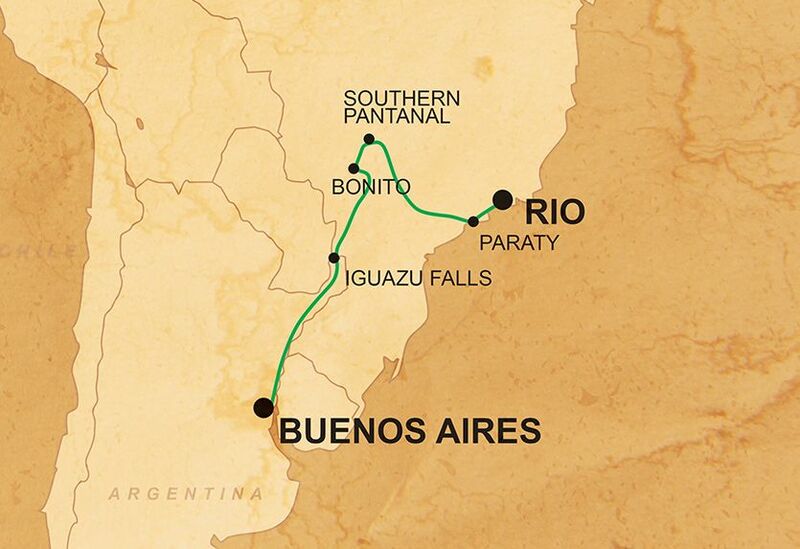 On this epic trip through Argentina and Brazil, we will be travelling overland, using a combination of overland vehicles, boats, and 4x4s, thus cutting out the need for air travel and reducing carbon-emissions. Going overland (by car and on foot for excursions) means you get to experience physically crossing the borders between countries as well as explore places which are off the beaten track.